The National Weather Service (NWS) is forecasting a strong but fast-moving coastal storm on Thursday that will bring accumulating snow across the entire state, with the eastern half of the state seeing the greatest amounts. Strong to damaging winds are also expected across much of the state; however the Cape and Islands will experience the strongest winds. These winds combined with wet, heavy snow in areas, bring potential for scattered to widespread power outages, particularly in southeastern MA. In addition, there is the potential for moderate and pockets of major coastal flooding, primarily in areas south of Boston along the coast of Plymouth County and in Cape Cod Bay. Following the storm, bitterly cold weather, with wind chill values of -15 to -35, will return on Friday and persist into the weekend.  Snow will overspread the region starting early Thursday morning (between 3 AM and 6 AM) with the heaviest snowfall occurring mid-morning through early afternoon, with the potential of snowfall rates of 2 – 3 inches per hour during this time period. Blizzard conditions are possibly in eastern Massachusetts. Snow will begin tapering off to snow showers Thursday afternoon/evening (between 3 PM and 7 PM). The consistency of the snow is likely to be wet and heavy in southeastern Massachusetts, and drier/lighter to the north and west.  On the Cape and Islands, precipitation may start as snow but will transition to rain and then back to snow for a brief period in the late afternoon as temperatures drop. A flash freeze is possible in this area.  All of the state will see accumulating snow, with the greatest amounts in eastern and central Massachusetts, which could receive 7-14” of snow with locally higher amounts possible. The Cape and Islands is expected to receive up to 4” of snow, while western Massachusetts could see 3-6” of snow.  Wind will increase Thursday morning and last into the evening. Interior Massachusetts could see 40-50 MPH gusts, with 45-65 MPH gusts near the coast and up to 70 MPH gusts on the Cape and Islands and possibly Cape Ann.  Thursday’s midday high tide (which will occur between 12:30 and 2 PM at most Massachusetts east coast locations) is an astronomical high tide. Combined with the 2 to 3 feet of storm surge forecast, this tide could result in moderate to major coastal flooding impacts, especially south of Boston along the Plymouth county Cape Cod bay coastline.  Bitterly cold weather will return Friday and Saturday. Daytime highs will hover around 0 degrees, while overnight lows could reach 10-20 degrees below zero.  Wind chills could be as low as 15-35 degrees below zero, particularly on Friday night when wind gusts are expected to be 35-50 mph over much of Massachusetts.  Snowfall combined with strong winds will result in poor visibility and difficult travel conditions throughout Massachusetts on Thursday. Both morning and evening commutes are forecast to be impacted. 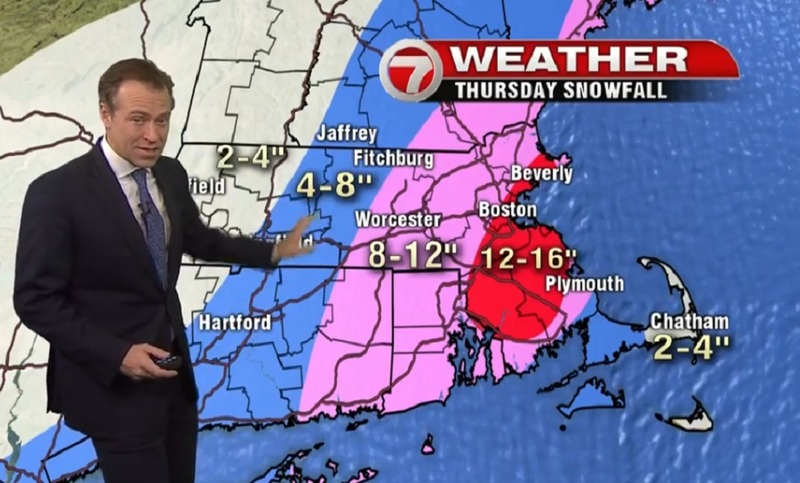 Blizzard conditions are possible in eastern Massachusetts and travel in this area could become difficult to impossible.  The combination of winds and snow present the potential for tree damage and scattered to widespread power outages, especially in southeastern Massachusetts and Cape Ann where snow will be wet and heavy. Communities should be preparing for the potential need for shelter operations as temperature are going to become very cold.  A flash freeze is possible Thursday afternoon on the Cape and Islands where there will be a mix of snow and rain, resulting in icy conditions on roads and sidewalks.  Moderate with pockets of major coastal flooding are forecast. This may translate to fairly widespread flooding of vulnerable shore roads and basements. Poor drainage due to snow and ice clogging may cause flood waters to be slow to recede. Any standing water left by coastal flooding is likely to freeze.  Waves on top of the high water level are likely to cause damage to vulnerable beach access stairs, docks, beach parking lots, and decks/porches near the surf zone. Sea ice could also exacerbate shoreline damage, especially along the Plymouth County coast from Hull to Plymouth and the coast of Cape Cod Bay from Sandwich to Dennis. Isolated damage to some homes and businesses along the immediate shoreline is possible, and a few neighborhoods may become isolated for a period around the time of high tide.  Freezing spray will likely accumulate on immediate shoreline structures from Salisbury to Plymouth.  Beach erosion will likely be moderate to severe with the eventual severity a function of just how high the waves build by the time of high tide. The ocean side of the outer Cape and the east side of Nantucket are likely to be most prone to erosion impacts.  Potentially life-threatening wind chill temperatures (15 to 35 degrees below zero).  Frostbite and hypothermia possible for those without proper protection from the cold. Frostbite can occur in as little as 10 to 30 minutes for unprotected skin.  Possible increase in fires from unsafe/improper use of alternative heating sources or people trying to thaw frozen pipes with blowtorches or similar devices.  Possible increase in incidents of carbon monoxide poisoning from unsafe/improper use of alternative heating sources.  Possible water main breaks and pipe bursts.  The State Emergency Operations Center is operating at Level 1 (Steady State Monitoring), and will activate to a Level 2 Thursday morning at 6:00 a.m.
 MEMA will conduct a conference call with local emergency management officials at 3:00 p.m. this afternoon (Wednesday).  MEMA will continue to monitor the forecast and will disseminate Situational Awareness Statements as necessary.